I caught a cold and I've been miserable. I'm finally getting over it, thankfully! That spring cleaning I was talking about doing... Yeah, it didn't happen (except for a few charts I sold - thank you to those who bought them)! I go down to Florida April 1st and I was hoping to get a lot done before then. Maybe I still can, if I can find the motivation! 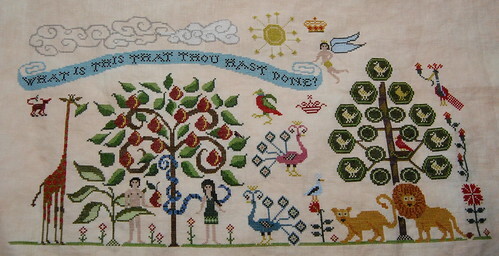 I finished the angel, sun, and crown on the right side of the banner and started on the clouds above the banner. I also decided to start something new.. It's Summer Iris by Blackbird Designs. 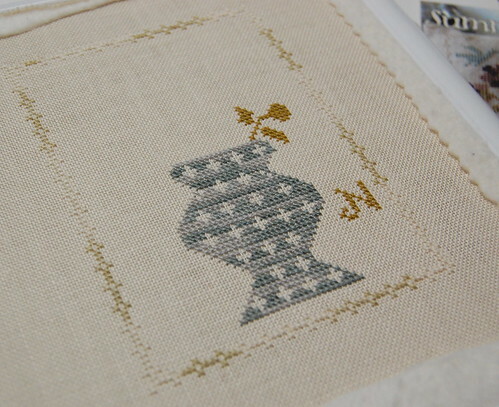 I'm stitching it on 34 ct. Legacy Linen (Cafe Au Lait) using the recommended WDW and GAST threads (2 over 2). Some nice progress; despite your cold, Nicole! :) Hope you feel better soon and have a great trip. Oh wow! I love that BBD piece -- the colors are wonderful! And Paradise Lost -- beautiful! I hope you're feeling better soon! I love seeing your progress on PL. The colors POP! Both pieces are looking lovely. Hope your cold clears up soon. Sorry you've been poorly Nicole - feel better soon! Love your progress on PL and your new start - the colours of SI look gorgeous on the C au L fabric! Your WIPs are looking good Nicole. Sorry to hear that you haven't been feeling well... that's the pits. Both are great! I have to have that BBD now, since I seen your in progress!!! Sorry to hear that you caught a cold. I hope you are feeling better. Paradise Lost looks great. You are well past the halfway mark. :) Your BBD start is very pretty also. I sure hope you get feeling better. Seems that old cold stuff is going around and people are getting really sick. I'm sorry to hear that you haven't been feeling. I think that the seasonal change colds have just got to be about the worst ones that you can get. You've made great progress especially on PL even though you haven't been feeling well. Hope you're 100 percent soon!! Poor you with the cold! Frustrating not to get done what you wanted to, but you still made progress and they're both beautiful. Blergh--I think the colds happen when the weather changes. We're all trading colds here, too. I hope you're feeling better soon, Nicole! Love the progress on PL, and your Summer Iris is fantastic! How awful you've got a cold, Nicole. Glad to see it hasn't stopped you from stitching all together. Still making good progress on Paradise Lost, and I'm loving your Summer Iris. You've done your initial much better than the one I did, I may have to redo mine. :) Never been completely happy with it. I hope you get well soon. Your WIPs look fantastic! Sorry to hear that you aren't feeling well. :( I do hope your cold is all gone before you head off on vacation. Both your wips look fabulous. PL is stunning. And I love the BBC piece. Great progress on both! Feel better soon. The Florida sun is waiting for you (we have been sunny and 70 all day near Tampa). Glad you are feeling better. Your PL and little BBD piece are both so pretty :-). Wow what a beautiful sampler! Beautiful stitching and love the new start! Hope you feel better soon. I hope you feel much better now and that this will also help. Paradise Lost is looking awesome - and I can't wait to see your BBD Irises finishes, that's one of my favourite BBD pieces. Hope you're managing to get over those dratted bugs! Hope you're feeling better soon! Summer Iris is so pretty - I love the soft colors in it. And your PL looks fabulous!! Great progress. That is a beautiful piece. I so admire your work. Beautiful work, as always! Hope you're feeling much better by now.